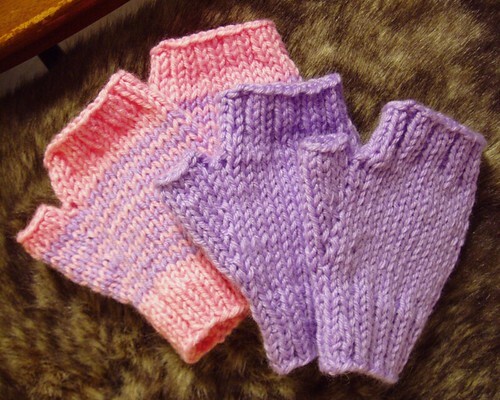 I was asked to make several pairs of fingerless mittens for someone at work recently, two of which were for little hands. 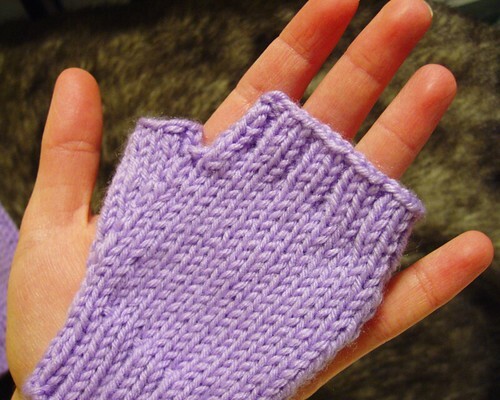 This was the first time I made mitts that small, so it was interesting. 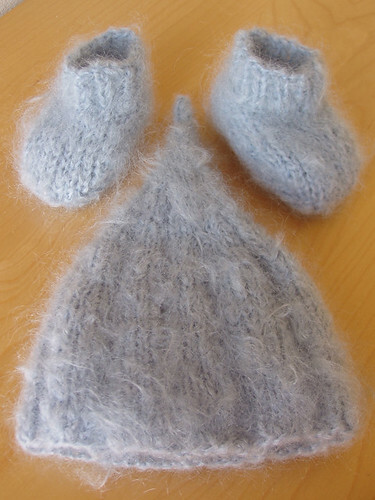 I had intended to make children’s mittens for my show this year, but it was just one more thing I didn’t get to. But since these were so darn cute, I might be motivated to work harder for 2010! Three years ago I met Lydia primarily because her daughter, the Wee E, crawled into our camp at Pennsic. Happily, we’ve become really great friends. However, we only get to visit for two weeks once a year. I can say with confidence that she has made my Pennsic experience so much better! Well, last year Eleanore had a lovely pink cloak and pink gillies. 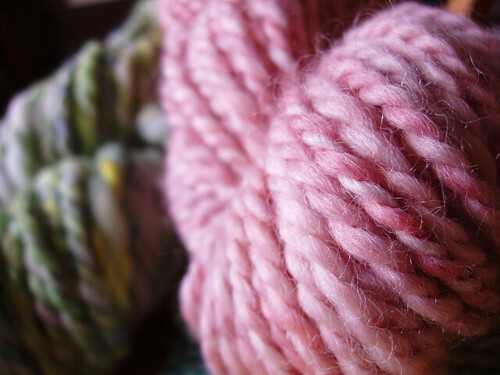 So when I dyed and spun a skein of pink yarn, I had to name it in her honor. 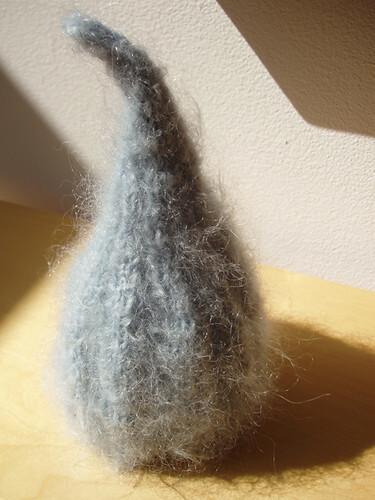 The yarn was spun bulky weight (4 WPI) from combed Romney top. 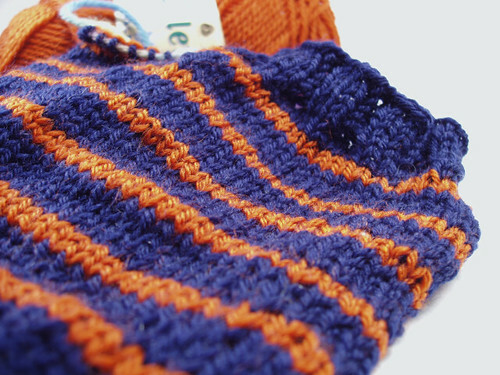 I was really happy with that skein and listed it in the shop for a long time, but no one purchased it. Then I found out that Lydia had been wanting it! I brought it out with me when I came back for the second week. 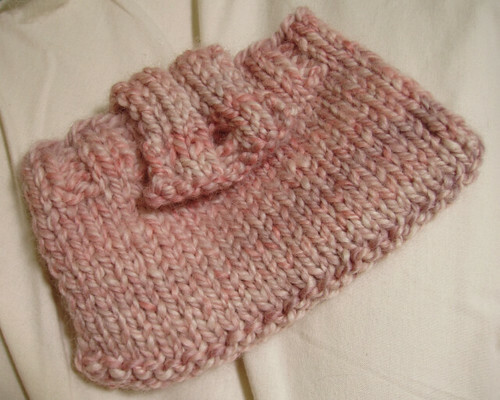 She asked if I’d knit something for her, so I made this little woolly pouch. Success! I’m glad to know it has a happy home, plus it’s the most productive thing I did the entire week! This weekend I’m going to our annual Winter Revel – “our” being the shire of Rivenvale. Each January we get together for an evening of dancing and eating. Last year we started to have a silent auction as a fundraiser. It makes sense on multiple levels. Either you have gobs of gear you are wanting to unload or you are a craftsperson with looking to share your talents. Of course I decided to contribute some yarn, but I couldn’t find anything appropriate in my stash. 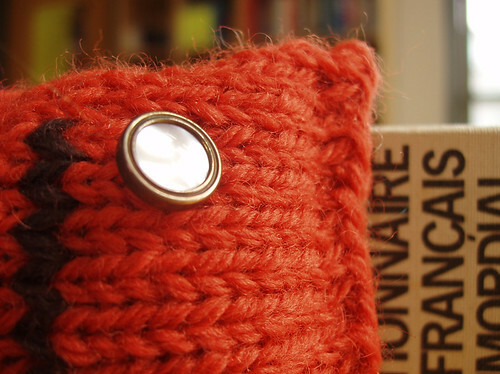 It couldn’t be dyed with chemical dyes or some huge and unruly bulky novelty yarn. 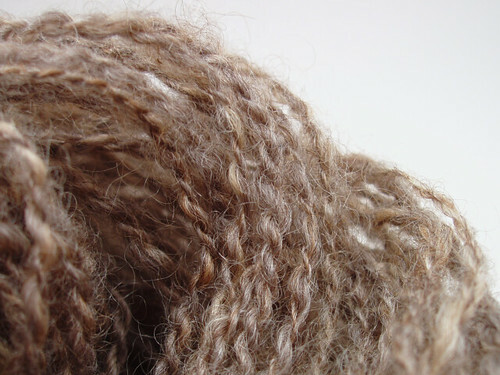 So I dug out some of my favorite locks from Sage, a BFL/Border Leicester cross. Flicked the ends, spun them long-draw and here is the delicate end result. I’m almost hoping no one wants it. Also started a new pair of fingerless mitts. My sister’s boyfriend requested these for a very specific job. He uses some sort of electronic drawing pad that makes his hand very hot and sweaty. He was hoping to have these mittens to prevent the sweat from going all over. After nearly completing one, I realized perhaps wool was not the best choice. However, wool can have an insulating effect and does not necessarily mean it will cause him to sweat more. We’ll see what happens, eh? As the title indicates, the baby items are complete. 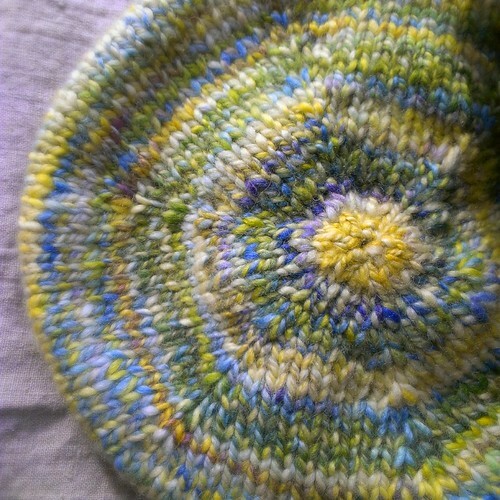 I worked on the hat Saturday and Sunday, finishing it in the evening. 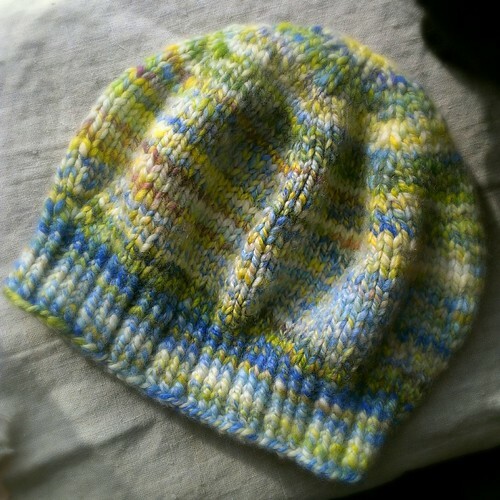 I looked around for a hat pattern that I wanted to use, but I didn’t see any that I suited my needs. So, I started knitting and just went for it! It needed to be pointy and amusing on top, so I decreased very slowly. Not having much experience “designing as I go” (or whatever) it just became what it became. I wish I could see it on an actual infant, but I do not know any. I knit? Yes I do! 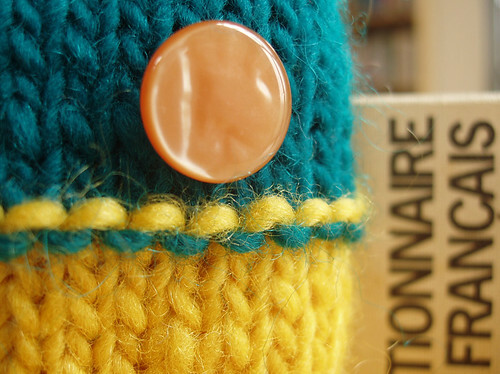 A few months ago (January), I made a little square monster for Johanna’s birthday gift. Wednesday she asked if I would make two more so she could give them to friends in need. 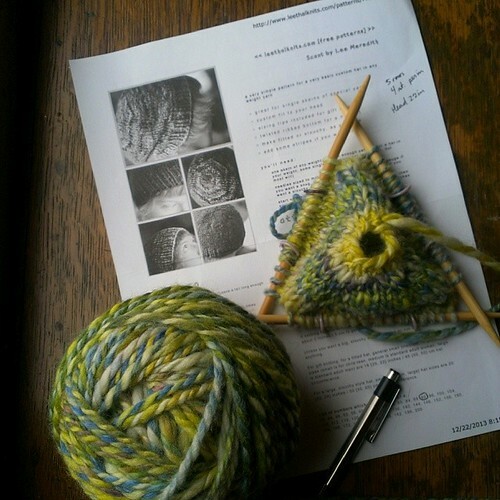 So, yesterday I dug around in my odds ‘n ends and pulled out a couple yarns to work with. 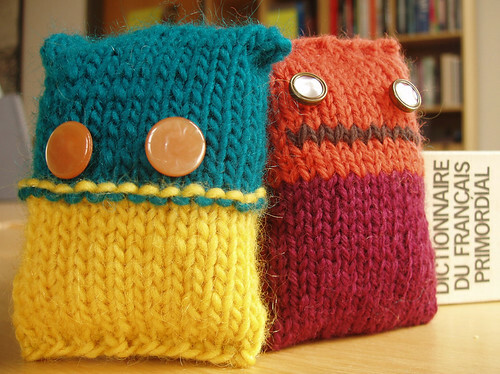 I knit these two little Meeps last night in no time at all. The eyes took considerably longer. One will be going to Bulgaria. These photos were taken in the office. The light in there is super and the color looks fantastic. I wish I could bring in all my stuff and photograph them there. Plus the bookshelf in the back makes a good background.